I was wary of up and down buttonhole stitch earlier, but when it was part of this challenge, I learnt the technique of the stitch. This technique proved useful to work this hedebo stitch. Still, it is a time consuming stitch. I worked a few more variations of this stitch and wrapped up this stitch sampler. 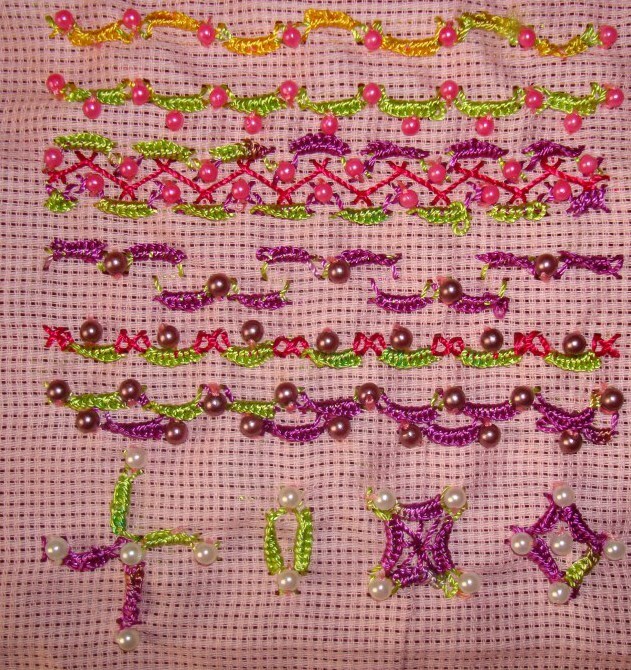 The cross stitches are worked in one[dark pink] thread and the hedebo stitches are worked in green thread in the second row, to see this distinction, the beads are worked over the hedebo stitches. Single hedebo stitch with two beads is worked between two hedebo stitches in the third row. Now, I need to catch up on those missed stitches. I worked a few more variations of this stitch today. 4. In the first row, the cross stitches are worked normally and the hedebo stitches are worked in two directions. Pink Pearl beads are attached to the hedebo stitches in the second row. Two lines of beaded hedebo stitches are worked facing each other and a line of herringbone stitch is worked between them on the third row. The 40th week stitch of the TAST 2012 challenge by SharonB is beaded hedebo stitch. I have not done this stitch before. When it was part of the earlier TAST challenge, I skipped over it, thinking it was too complicated. This time I cannot repeat the same thing. So started learning it. Worked this stitch with cone thread on even weave fabric. The thread was thick and it required a big needle, the beads were added after working the stitches. 2. Alternate stitches are worked on square crosses, which narrows them a little bit. 3. Two hedebo stitches are worked together in the first row, and wide stitches are worked with three beads in between in the second row. Hope I get more ideas for variations . This stitch takes some time to work though!